Ben Esposito's "Kachina"IndieCade, or, the International Festival of Independent Games was held last week, October 4-7, 2012. 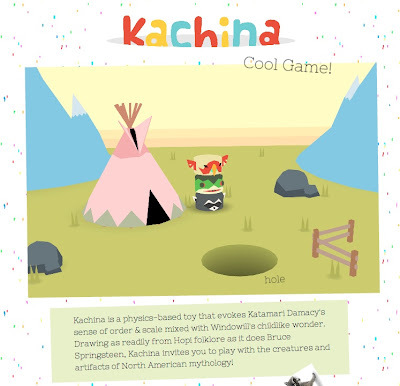 Kachina is a physics-based toy that evokes Katamari Damacy's sense of order & scale mixed with Windowill's childlike wonder. Drawing as readily from Hopi folklore as it does Bruce Springsteen, Kachina invites you to play with the creatures and artifacts of North American mythology.Reese sums up what's wrong with this game:Esposito and the IndieCade people who selected it as an Official Selection must not know that teepees and totem poles have nothing to do with the Hopi people. They obviously have no idea what kachinas mean to the Hopi people, and they also likely have no idea that calling the religious traditions of an Indigenous people "folklore" is derogatory.Comment: We should note that Hopi isn't the only tribe with kachinas. The Zuni and few other Pueblo tribes have them as well. Looking at the video of the game, there seems to be no Native content besides the teepee and totem pole. No kachinas, which is good, since the Hopi undoubtedly would object. No other artifacts. Maybe a couple of animals. Basically, it looks like there's no justification for the "Kachina" name. Or for the summary implying the game has substantial Native content. The Native concept appears to be a gimmick to make the game seem more educational and meaningful than it really is. For more on Native video games, see Assassin Creed 3's Mohawk Origin and Evolution Video Game Features Lakota.